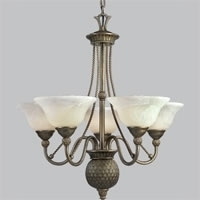 This chandelier has antique alabaster glass, twisted rope details, with a burnished chestnut finish on a steel housing. It has five GU-24 sockets. The lamps that are included are 13 watt spirals. This fixture is part of Progress Lighting's Savannah collection. Note that this fixture is not suitable for use in conjunction with dimmers.